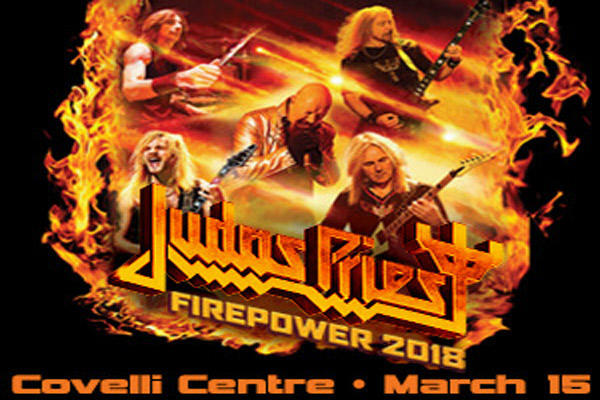 British heavy metal legends JUDAS PRIEST played the second show of their "Firepower" world tour Thursday night (March 15) at Covelli Centre in Youngstown, Ohio. The trek is the band's first since guitarist Glenn Tipton announced that he was retiring from the road due to his battle with Parkinson's disease. He is being replaced on tour by "Firepower" album producer Andy Sneap, also known for his work as the guitar player in NWOBHM revivalists HELL and cult thrash outfit SABBAT. Fan-filmed video footage of the show can be seen below. Tipton was diagnosed with Parkinson's disease 10 years ago, but only recently announced he was going to sit out touring activities in support of "Firepower". The guitarist, who is now 70 and has performed on every PRIEST album since the band's 1974 debut set, "Rocka Rolla", is not quitting the band, but simply cannot handle the rigorous challenges of performing live. Asked how JUDAS PRIEST came to choose Sneap to step in for Tipton on the band's tour in support of "Firepower", bassist Ian Hill told veteran Japanese rock journalist Masa Itoh: "It probably came from during the recording of the album. Andy is a very good guitarist, an excellent guitarist in his own right, and I think Glenn got to know Andy and got to trust Andy, which is very important. We wanted someone who we knew as well, if at all possible. The last thing you want is somebody coming in with their own baggage, if you know what I mean. And we can trust Andy to do a good job, and I think he'll do justice to the songs. And that was the main thing — I think it was the familiarity with Andy. We had great respect for him — before we met him, we had great respect for him. But with the work he did on the album — I mean, it sounds phenomenal; he did a tremendous job with that. We're doing songs off the new album, which he is totally familiar with, and he knows a lot of the parts anyway from that. And he's also a PRIEST fan — he's been listening to us for years — and he fits the slot perfectly. I think he'll fit in and I think he'll do a tremendous job." "Firepower" was released on March 9 via Epic. The follow-up to 2014's "Redeemer Of Souls" was recorded by Sneap, the band's longtime collaborator Tom Allom and engineer Mike Exeter (BLACK SABBATH). The cover artwork for "Firepower" was created by the Chilean/Italian artist Claudio Bergamin. The North American leg of the "Firepower" tour will wrap on May 1 in San Antonio, Texas.